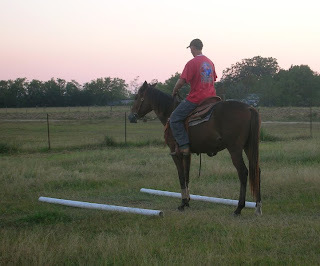 For the past week I have been working hard on the canter, with Ozzie. I have really been trying to get him to relax. 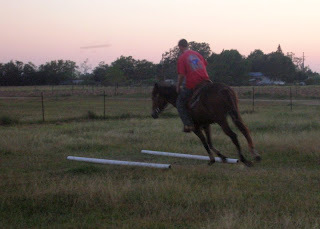 We do a lot of ground work and we do some lunging. 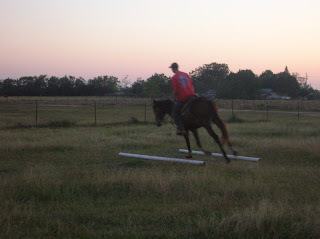 While on the lunge line I can get Ozzie to pick up the canter from a walk. He will canter around at a slow steady pace. It looks so wonderful. But then things get all complicated, when I get on his back. Ozzie likes to go super fast and he, for some reason, forgets how to do a circle. 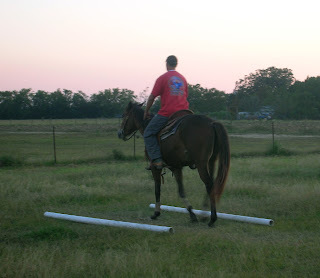 It's all pilot error, because I know he can do it on the lunge line without any problems. So, when I encounter pilot error, what do I do? I call on Mr. Cowboy for some help. He is braver than I am, and he will kick harder than I do. It's all about Ozzie dropping his shoulder. The pictures I have here are from the first evening Mr. Cowboy rode Ozzie. 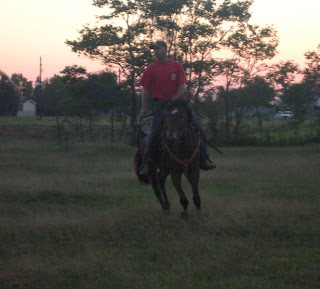 A week later, Ozzie is now being ridden across the street from our house in an open field. Ozzie has been walked through ditches, in and out of the woods, through water, and he even helped Mr. Cowboy pull some low branches off of the trees. I have set up a "shoot" with two ground poles. These poles are the center of my circles. This is where I work on straightness. Ozzie must come into the shoot straight. He must halt straight and square. Mr. 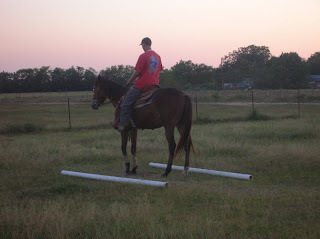 Cowboy isn't as picky about the exercise as I am. So, we will give him some slack when he whoas Ozzie a bit early. Ozzie then walks off and the rider chooses the direction of the circle. Mr. Cowboy has picked to work on the left circle. I then have set up two cones at the other end of the circle. This is to help me make my circles more round. I am a horrible at circles. My circles end up more egg shaped. Then when you come back to the shoot, you halt and back. The back should be straight. This is when Ozzie first started to back with Mr. Cowboy. Now Ozzie backs with his neck supple and nose tucked under. It's amazing what a week of riding will do. I need to get after pictures or even better, a video. After working it at the trot to the left, Mr. 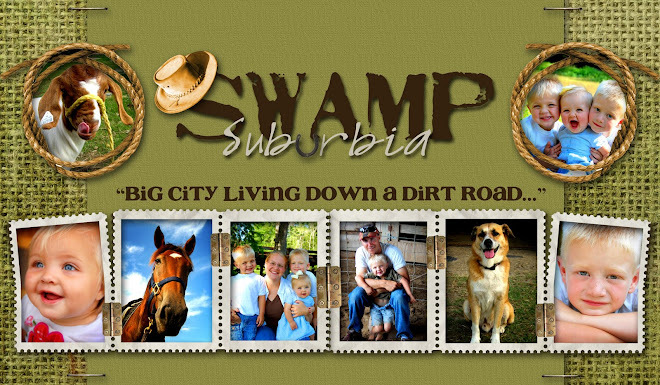 Cowboy then works to the right. Ozzie turns and works better to the right. At that point Ozzie was still having to be "guided" with the rein. You can see Mr. 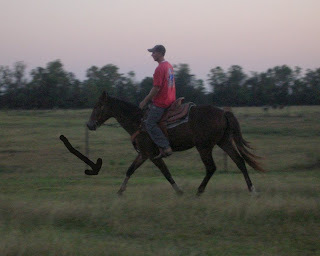 Cowboy's right hand going out to "guide" Ozzie around his turn. Now you do not have to guide him as much. He still needs some reminders, but he is a lot better. Then it's time for the canter. The left canter circle was very nice. 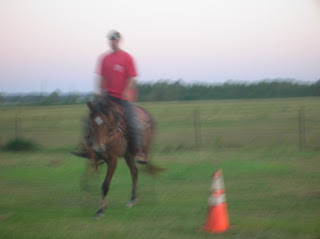 Ozzie did not try to canter at incredible speeds. He was relaxed and Ozzie tried to listen to what he was supposed to do. That is one thing I really like about Ozzie, he really trusts his rider. 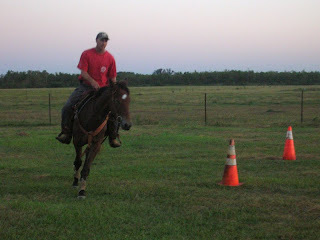 Canter around the cones, and then onto the shoot. He came into the shoot a bit off. But he fixed it. 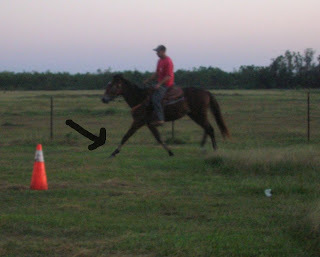 At this point the right canter circle was not as pretty as the left. Ozzie has come back from the "trainer" with what I call a "rubber" neck. When you go to turn him his head and neck will turn all the way to Ozzie's side, but his body will stay going straight. I have worked on this by doing some counter bending and doing a lot of riding in squares. I think all this work has really paid off. I will video the next ride. Until I get that video, here are two pictures I took of Mr. 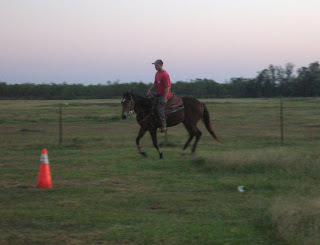 Cowboy trotting Ozzie. This horse can really extend. And when Ozzie extends, he is not trotting fast, he just extends. This one is not as extended as the next one. Holy smokes!! I actually think in that picture he was about to canter. But that horse has some serious reach. 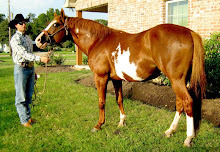 For being a short 15.1 hand horse. Ozzie has come along way in just a short two weeks. I keep trying to think about the end result, how well Ozzie will ride in 4 months or 8 months or even a year. That to me is exciting. Happy riding to you, you stud muffin! I agree with the Wades. Forget the trainers and have some faith n yourself!!!! He looks great! Are you sure he's only 15.1 hh? From teh very first picture I was going ask you if Ozzie has grown much in the past couple weeks. He sure looks much taller. After falling from him recently, would you say it was only a small horse fall? Man, that boy looks tall! When have you last measured him? I agree with what others have said...that you really sound so knowledgeable and should just train Ozzie yourselves. Look at how much he's advanced since he's come back from the trainers. It's all you and Mr Cowboy, girlfriend! Yea, I was kind of wondering why you send Ozzie to the trainer too? I sorta just assumed it was a time issue. Certainly not because you didn't know what you are doing!! 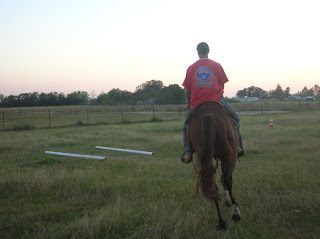 You and Mr Cowboy have made great strides with him since he has been home. Good work guys! Doing great! I agree with everyone else! By golly, you are right! That Ozzie can sure extend! He looks really good, Andrea, and I am so happy that he is back with you...I am sure that he is too...lol!!! 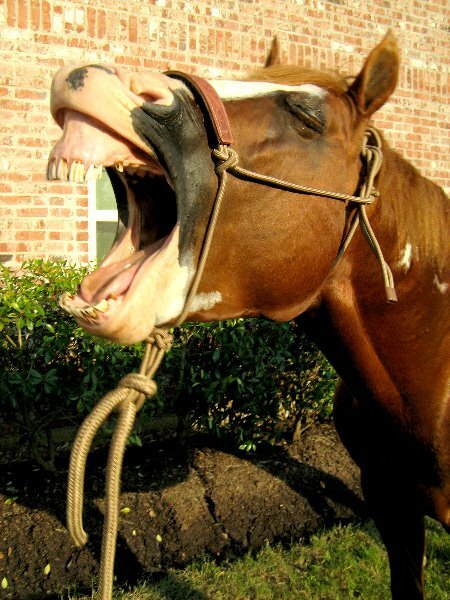 Glad you got your horse back from the trainers. Seems you guys are doing a better job too. He has a nice gait on him, love that canter!